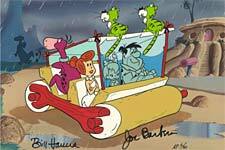 The Flintstones rumble along in the Flintstonemobile using stone age technology to keep the windshield clear. The imaginative gizmos and gadgets used by the Flintstones and Rubbles are a unique part of the Hanna Barbera Studios series. Prior to The Flintstones, The Ruff and Reddy Show actually launched the Hanna Barbera studio into its incredible creative dominance of animation for television in 1957, followed by the Huckleberry Hound Show in 1958 and then the premiere in 1960 of the stone age hit The Flintstones. The popularity of space age events and UFO’s at the time inspired the studio to create another family situation…but in the future.